Smiling Paws litter mat helps you to reduce litter tracking on your floors, containing most part of the litter in the mat and not outside of it. The soft texture with TM9 catcher technology will efficiently catch the excess of litter from your cat’s paws when exiting the litter box. Smiling Paws extra large size will cover a more extensive area of the litter box than other similar mats. 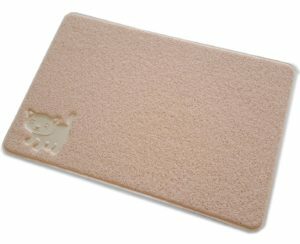 The litter mat features a unique non-slip backing for added support of the litter box. The unit is solid, made from durable premium commercial-grade vinyl that doesn’t contain chemicals and BPA free. Rated 5 stars from Veterinary Association approval. Tested and certified to trap more litter than other mats. Premium high quality and durable material with TM-9 trapper technology. Non-slip backing system, the mat won’t slide on floors. 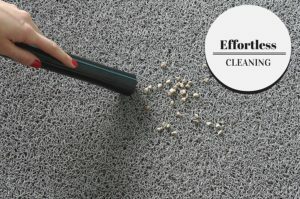 Easy to clean by shaking or vacuum the litter trapped on the mat. Waterproof and odor-resistant. Liquids won’t leak through. 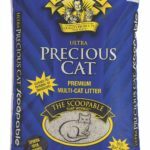 Suitable for most types of litter such as clumping and non-clumping clay, crystals, silica gel, pine, recycled paper, corn, wheat. Beautiful design with a cute cat on it. Good anti-tracking system, reducing between 80% to 90% of litter, depending on the type. 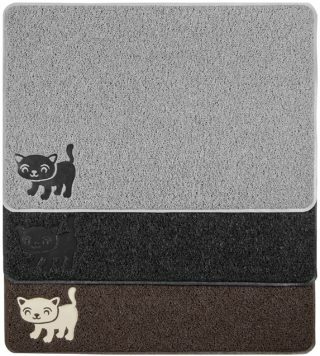 Soft on the cat’s paws so less chance of your cat avoiding to walk on the litter mat. Top layer “loofah” material is soft and comfortable. It isn’t hard to step on bare foot. Thick, durable and high-quality material. Anti-skid so it doesn’t move around floors (hard floor or carpet). Nice large size covers more of the litter area. Free of toxins and BPA. It doesn’t have a strong plastic smell. Waterproof. The backing is a soft rubberlike waterproof thick material. Due to its twisting fibers, some litter get stuck on the mat and can’t be removed only by shaking it. A vaccum cleaner does a better job. 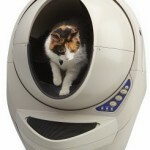 Its texture makes it not easy to clean if your cat has a litter box “accident” with feces on it. √ A good idea to wash the litter mat is using a high-pressure hose for deep cleaning and using environmentally friendly detergent. √ The mat comes rolled so in order to make it flat, without wrinkles, you need to apply heat using a blow dryer or leave it outside in the sun if there is a nice day. √ The Ruby Beige color is actually more close to peach-light pink color. 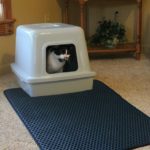 Smiling Paws litter mat is a high-quality litter mat that works as advertised in the sense that effectively catches litter from the cat’s paws reducing considerably litter tracking around the house. 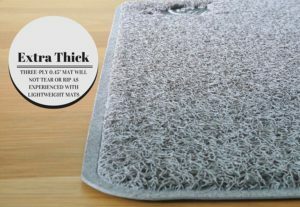 This litter mat is so effective that some litter might get stuck inside the surface and it’ll need to be cleaned with a vacuum cleaner, but also shaking the mat releases most parts of the trapped litter. The design is really cute and beautiful. I highly recommend Smiling Paws litter mat to any cat owner, ideal for messy cats.